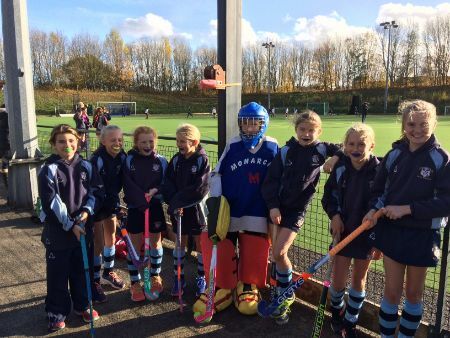 U11A EGHA tournament at Burgess Hill. This was a lovely day of hockey. As ever, the tournament was superbly organised, and after an initial downpour, the weather held for a great tournament. First, we played Lingfield, and were slow to get going. We let in a goal almost immediately, but kept on. We eventually got into the game, and had more possession, but lost another goal to a counter attack. For the last 3 minutes we kept the ball in their third of the pitch, and some strong play from the right resulted in a beautifully taken goal from Ruby M. We then went for the draw, and had to delay the final whistle because we had a succession of short corners, but frustratingly could not make one count. Next we played Brighton College. They were strong down the middle and we did not adjust sufficiently to prevent two attacks through our centre. Although again we were a strong presence, but missed that killer instinct in front of goal. Next we played Great Walstead. Again, we had a great deal of the play, but could not get a crisp, hard shot on target. We lost to one breakaway goal. We went into the plate, but again had the same pattern. This time the ball did not enter our defending half apart from when they scored! How frustrating! Especially when on occasions we did play some very good hockey. We really enjoyed playing schools we don’t normally meet at our weekly fixtures, and loved the challenge of playing in a tournament of such a high standard. Thank you to Mrs Morris, Mrs Hues and Mrs Honychurch for coming to support us and for your loud encouragement. Thank you, Charlie for driving us and encouraging us throughout the day. And of course a big well done and thank you to the team; Rachel B, Ruby M, Lottie H, Emily H, Millie DH, Kitty H, Ruby A and Cordelia E.